Where in the Ocean Do Manatees Live? Which Animals Eat Manta Rays? 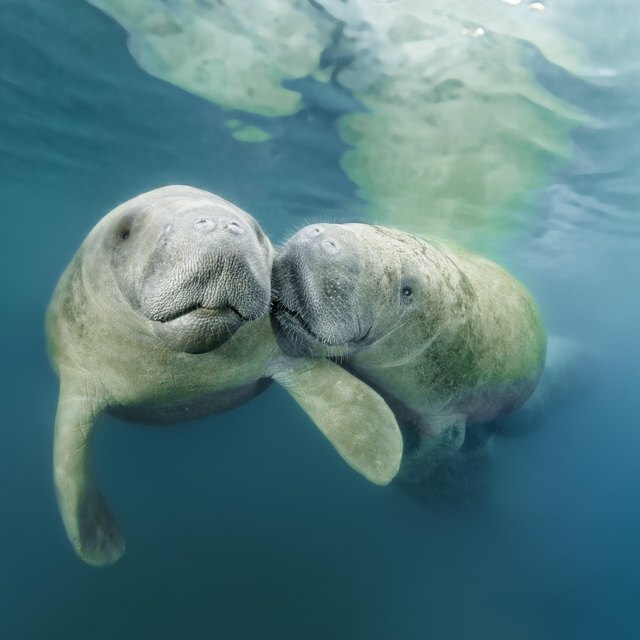 The Florida manatee, along with the Antillean manatee of more southerly waters, is one of two subspecies of West Indian manatee, the biggest extant member of the Order Sirenia, which also includes two other manatees, the Amazonian and African, and the sole species of dugong. Like its relatives, the Florida manatee -- native to the Gulf and Atlantic coasts of the southeastern United States -- is a large, placid, slow-moving marine mammal suited to warm, shallow near-shore, estuarine and riverine environments. Biotic factors in their ecosystem refer to organisms enmeshed in the same ecological web that directly influence manatees. Manatees and dugongs are the only entirely herbivorous marine mammals. According to the International Union for the Conservation of Nature, Florida manatees may boast a particularly varied diet compared to more wholly tropical counterparts because of the diversity of habitats encompassed in their subtropical and temperate range, which is centered on Florida but extends at its summer maximum west to Texas and north well up the East Coast. They nonetheless appear to feed most heavily on seagrasses, which are hugely important sustenance for sirenians across the globe; specific species favored by the Florida manatee include manatee grass and shoalgrass. In addition, manatees may nibble on other aquatic plants, such as smooth cordgrass, a saltmarsh specialist, as well as on floating, overhanging and bankside vegetation, from true grasses to mangrove foliage. The grittiness of their plant fodder explains the relentless wearing-down and replacement of manatee molars. Other adaptations for a grazing lifestyle include the animal's rubbery, highly mobile, cleft lips, which are set prominently forward to facilitate both bottom- and surface-feeding. Marine plants help shape Florida-manatee distribution and habitat. 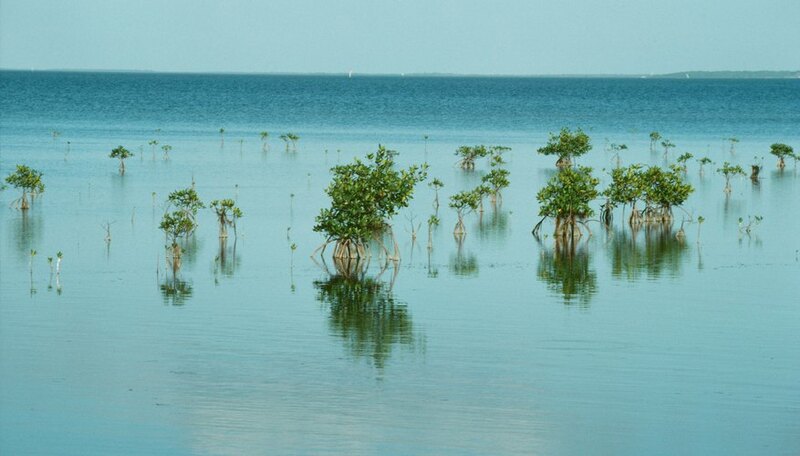 Such vegetation is restricted to settings adequately sunlit to power photosynthesis, which partly explains the predilection manatees show for shallow-water environments such as rivers, estuaries, lagoons, bays and near-shore shelves. 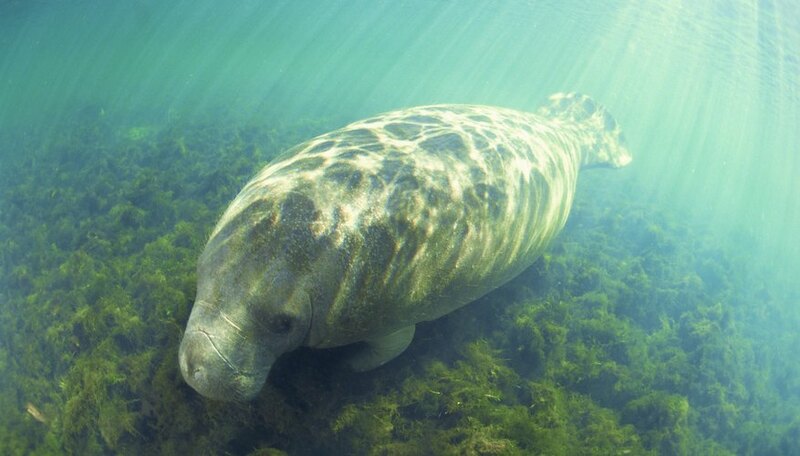 Aquatic and semi-aquatic organisms can also shape and define general manatee habitats, most notably in the case of seagrass meadows but also mangrove swamps and salt marshes, the latter sometimes grazed by the animals at high tide. Despite their slow-moving habits and lack of real defensive weaponry, manatees apparently are rarely preyed upon in the wild -- perhaps due to their size and a generally lower incidence of big predators in their favored shallow-water habitat. 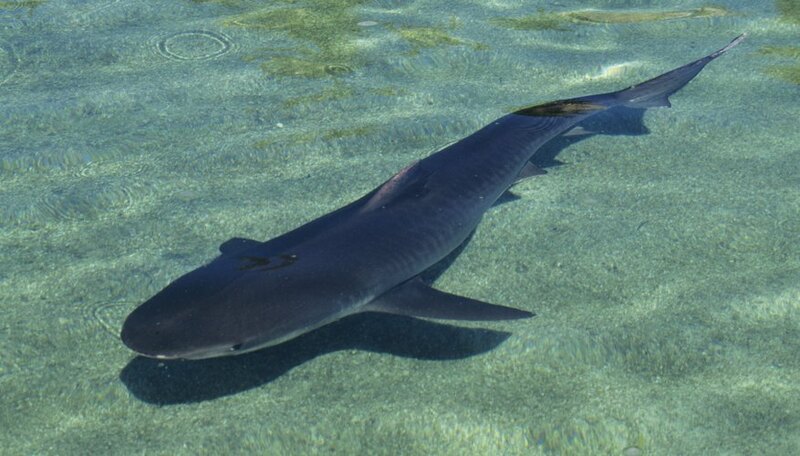 Large sharks such as tiger and bull sharks, both of which do enter bays, estuaries and river mouths, may pose a threat to Florida manatees in those waters. Other potential predators include American alligators and crocodiles, the latter wide-ranging along the South Florida coast. Orcas, which have been implicated in attacks on dugongs in the Indian Ocean, aren’t particularly common in manatee range. Calves are likely more vulnerable than adults to such hunters. Far more threatening to manatees than sharks or crocodiles are human beings, who have been responsible for major mortality and habitat encroachment in all sirenian species -- and actively extirpated one in historical times: the Steller’s sea cow, formerly native to the North Pacific. While Florida manatees aren’t as vulnerable to poaching and overhunting as their Antillean, Amazonian and African counterparts, they have historically suffered significant injury and death from boat propellers. Water pollution, habitat modification and alterations of water temperature and marine-ecosystem dynamics by global warming are other anthropogenic threats. During winter, some manatees retreat to South Florida waters or seek out warm-water refuges such as artesian springs or -- notably -- balmy outflow from industrial facilities. The latter is an apparently beneficial human impact on manatee populations, although the full ecological implications of such artificial wintering hubs aren't clear. Ecology and Conservation of the Sirenia: Dugongs and Manatees; Helene Marsh, et al. Which Animals Live on the Pelagic Zone? Shaw, Ethan. "Biotic Factors in the Florida Manatee Ecosystem." Sciencing, https://sciencing.com/biotic-factors-florida-manatee-ecosystem-7744.html. 24 April 2017.